A long time ago I wrote a post about how anyone could get Facebook advertising coupon codes to start their promotions campaigns with a head start from Facebook themselves, by getting a $50 Facebook ad coupon. Afterward, Facebook has tightened its belt and partnered only with certain online services providers, who gave their new users a $50 coupon. I wrote about these services in this blog post here. However, most of these partnerships have expired last year, and those that haven’t will require you to spend some money on the service first. 1. The first way I got a coupon was a satisfaction survey FB ran for existing advertisers. I participated in the survey and got a $75 ad coupon towards future advertising. 2. 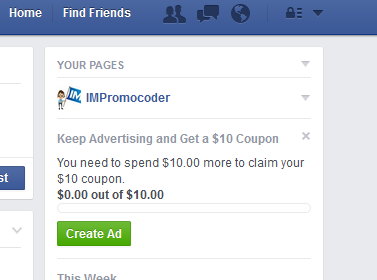 The second coupon came from an ad that Facebook ran on right sidebar offering me to spend $10 on ads and get an additional $10 as a bonus. Unfortunately, I didn’t capture the ad image to show you, but here’s a proof of the added credit I received. So it’s worthwhile looking at ads every once in a while. I’ll add that this was offered to me when I had a long pause in my FB ad campaigns, so this is obviously a hook for previously active advertisers, and I wouldn’t expect this to be offered to you if you currently have an active campaign and also if you never ran one before. Update: In 2019, Facebook offered me these coupons on my FB feed and also on my Instagram feed. As you probably know, IG is owned by Facebook, and to advertise on IG you have to go through the Facebook ad platform. Meaning, you can use both Instagram and Facebook coupons to advertise on FB and IG. Get help with IG ads here. Facebook ads free credit. Newsfeed ad. 3. The third way to get a FB coupon is a series of events FB started to run, named Boost Your Business. These events are designed to help small business owners get the max out their Facebook advertising or general activity. There are two types of events. The event I took part in was a short, 2 hours gathering in West LA. These short events are called 2-hour pop-up events and a handful of participants received $500 worth of Facebook advertising coupons. The other sort of gatherings are the half-day events. These occur less often and carry a symbolic participation price. However, all participants leave with a $50 FB ad credit. The latest events in my area (Southern California) were in March in Fremont, Los Angeles and San Fernando, CA ($100-$500 coupons were given to some participants). To view the upcoming months Boost events, head here. 4. Fourth FB coupon method, though likely relevant only to a small portion of my readers, is the promotion that Facebook is offering mobile start-ups and app developers. If you’re one of them, head to the FbStart program, where you will need to apply, and if accepted, you will be offered with up to $80,000 in various tools and services, including $500 in free advertising credits. As per an early report here, more than $100 million in benefits were distributed during the first year. 5. The Fifth FB coupon method- Facebook is occasionally holding holiday creative challenges/contests, (the last one I saw was at the beginning of the year), where you can win anywhere between $300-$1,000 worth of Facebook ad vouchers, plus Amazon gift cards. You will need to create a successful and creative campaign to win this one as you will be evaluated for your creativity, improvement over time and quality of ads, and we recommend you get a cost-effective professional help for that. Make sure to read the terms and condition of the promotion to see that you qualify. An alternative option, relevant only to business owners with products/services of their own (rather than affiliates or small websites/bloggers) would be checking platforms like Yelp (Get $300 in free Yelp ads here). True, it’s not quite like Facebook ads, but it’s probably the best advertising platform for small, local business and this link can provide your store with some significant, free advertising. Also, you can get a never-ending trial account on Shopify, until you make your first 50 sales (which is a great way to save, as it can take a while for new entrepreneurs to reach 50 paying customers). Are you a content creator? If you create high quality videos, Facebook will pay you to create up to four monthly videos, via their Facebook for Creators program. And what if you don’t fit into any of the promotions above? I can suggest a few options. First and foremost, you’re invited to subscribe to our newsletter. We update whenever there are new advertising coupons given away on many ad networks, not only Facebook but also Bing Adcenter, Google Adwords, Yahoo and other leading advertising platforms. Second, up until last year, the best place to find Facebook coupons was Fiverr.com (Fiverr is the most successful outsourcing marketplace startup, reviewed by TechCrunch, The New York Times and many others, recently received another round of $60M in funding). You can usually count on them to find anything you can imagine. Previously, I listed the best coupon sellers on Fiverr, however, I want to recommend some other super sellers that will help you with your FB ad campaigns. Look at some of these, and go from there to wherever your search might take you. Other than that you could probably use more fans or likes and etc. While searching for Facebook ad coupons you can get Bing Adcenter coupons [contact us]- Get Your Coupon! And how about Adwords coupons? – Get Your Coupon! I will try to keep this list updated. However, if the above doesn’t suit your current needs, have a look at the online marketing gigs or the business promotion gigs or use the search to check for whatever you are currently in need of. If you find someone who is selling Facebook ad coupons on Fiverr and not listed above, please do share it with us. So, as opposed to what some might say, Facebook coupons are still out there, even in 2019. The system may not be as loose as it was with giving out the advertising coupons to anyone, anytime, but there are plenty of events and occasions worldwide where the coupons are issued and handed out. If you liked this article, please share it with your friends via Facebook, Twitter, or feature it in a blog post of your own. Most of the share buttons are comfortably displayed. You may contact us for queries or joint ventures as well! How can you get a free Facebook Ad Coupon? Hi, as I mentioned in the post, it’s very difficult, if not impossible, for an individual to get a facebook coupon for free. However, there are professional services which offer valid FB ads coupons for as low as $5. That’s what this post is for, to show the most reliable service providers ( I use them myself! ). Getting $50 worth of ads for just $5 is a heck of a deal! hi guys! Anybody out there have the facebook coupon ads 50$?. please contact me. i will buy all you have. thanks! I actually checked out the gigs and feel they’re worth giving a trial. I have a fanpage like 2 months old but i’ve never advertized. Will it work for me? It will work for you. It doesn’t matter how old is your FB account or your fan page, only thing that matters is that your FB advertiser account is not older than 14 days to be eligible to redeem the FB ad coupon. Best of luck, update us how it went. Hi, I was wondering having used this before and account is older than 14days if it possible for me to use this again or any other coupon i can use? i got the coupon as a starter but also have paid as normal to use facebook ads but its very expensive for me so looking for another method to advertise cheaper? 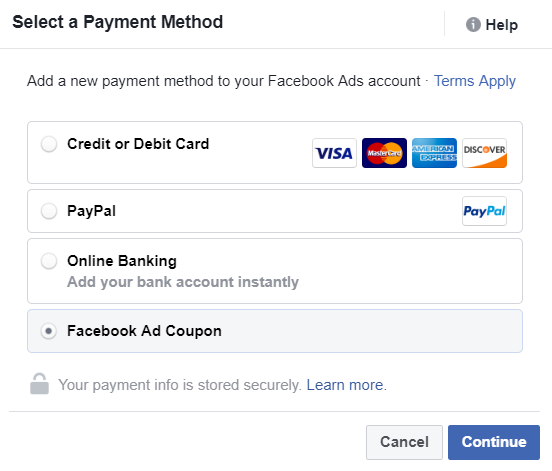 Unfortunately, you won’t be able to use a coupon on your current fb ads account. you can however use a fiend’s account that didn’t advertise before, or open a new account, with new payment method ( different CC/PP than the one you used) and you could apply the coupon on that account. You’re right, and I have updated the post. However, as these might change rapidly, I highly recommend searching on their site by yourself as well. Just search for facebook ads related gigs and you’ll definitely find something for your next fb campaign. I created another account on facebook to utilize my new facebook coupon code. But when I inserted my credit card number which i also used in my previous account, facebook banned my account for security reason and suspicious activity. Do we have to give all new accounts a different credit card or its just happen to me by luck ? Well, you used a different fb account with the same CC, of course that looks fraudulent. If you want to use a second fb ads coupon, you need to create a new fb account, use different payment details ( CC/PP) than on your first account and preferably promote a different campaign than the one you promoted. Need to remember that fb gives these coupons to new advertisers in order to introduce them to the advertising system, these are not just gifts they throw in the air. Thank you for the guide, i will do well to check them out- Am also looking for facebook coupon that work on old account. admin you forgot to add this link. I just got my code from her. She’s fast and reliable. Will order more. The post is updated with active FB coupon sellers. I’m also trustable coupon seller on Fiverr. Can you please add my gig to the page? Thanks! Nice collection, I am already using fb ads, will coupons works for me? Do I understand it right that I will only be able to use one coupon per facebook account and should that be a new account not older than a a specific number of days? Update AUGUST-15 for FB $50 coupons provided on Fiverr. This guy is providing the coupons on Fiverr with good reviews. You may check this out. just wanted to clarify one thing regarding $50 worth of coupons available at fiverr. Can they be used for existing FB business pages ( I’ve been running my page for about 6 months, have paid for ads and have about 4k of likes) or are they only applicable for newbies? Existing business FB pages are not a problem, the problem is that you already advertised before. 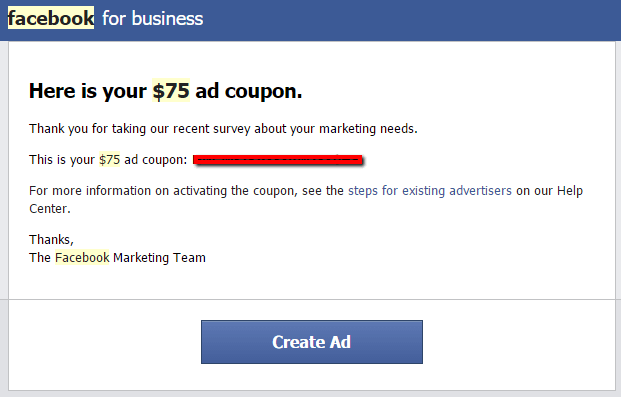 Normally, those Facebook coupons are for new advertisers only (though sometimes, some coupons are released to existing advertisers for answering FB surveys).